American psychedelic rock/blues rock band formed in July, 1965 in Los Angeles, CA, United States and disbanded in 1973. Inducted into Rock And Roll Hall of Fame in 1993 (Performer). The Doors In The Studio: "L.A. Woman"
Not important but was just wondering why the first two albums are listed in the wrong order. Probably the greatest band ever in the history of music. Magical. Does anyone know if the Doors reissues of Rhino vinyl 180gr (Released on September 2009) worth buying? The Doors ... This band helped shape my life. I got into them at an early age and almost 20 years on i'm still hooked. Ray Manzarik is amazing he plays keyboards and bass and filled in when Morrison failed to show at his own concerts. 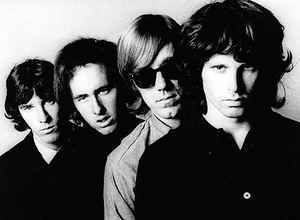 Robby Krieger is an amazing guitarist and John Densmore was definitley an under rated drummer. Jim Morrison usually stole the show with his boyish good looks and long flowing hair. Putting his all into every performance he helped lead himself to an early grave. This band surely must go down in history as one of the greatest band ever. They still have a huge following to this day with record sales and merchandising still at extremely high levels. Still an inspiration too many, i will never tire of listening to them. Awesome psychedlic bluesy rock band that sometimes don't get the credit or respect they deserve and are more associated with Jim Morrison's supposed antics. They created a really wonderful unique sound that still sounds incredible today. Their 6 albums are excellent, all created within 4 years. Some of their pieces of music are pure theatre/poetry incorporated into music, 'The End' is absolutely mesmerising, as is 'When The Music's Over'. 'Light My Fire' is just a fantastically funky rock tune that still does the business today. 'Riders On The Storm' is exquisite mellow jazzy rock... there are just so many great records by this fantastic band. Their best album for me is the first self-titled one and then I would say 'Strange Days', closely followed by 'LA Woman' and then 'Waiting For The Sun'.